Interim Dean Buys joined the SIU School of Law faculty in 2001. She teaches International Law, International Business Transactions, Constitutional Law, Immigration Law, and a variety of other international law and study abroad courses. In 2008, Dean Buys was a Fulbright Senior Specialist in Vilnius, Lithuania, and in 2015, she was a Visiting Professor at Bangor University in Wales. She has been named both the Outstanding Teacher of the Year (2013) and the Outstanding Scholar of the Year (2016). She also was awarded the Illinois State Bar Association Elmer Gertz Award in 2016 for her work advancing human rights. 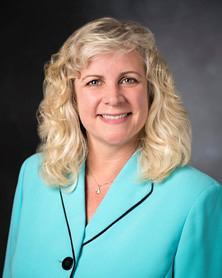 Dean Buys holds leadership positions in the American Society of International Law, the American Bar Association, the Illnois State Bar Association, and the United Nations Association–Southern Illinois Chapter. She is a member of the Illinois Human Trafficking Task Force and the Illinois Advisory Committee to the U.S. Commission on Civil Rights. She also serves as a panelist for NAFTA Chapter 19 disputes. Prior to coming to the SIU School of Law, Dean Buys spent ten years in public and private practice in Washington, D.C. Dean Buys was an attorney with the U.S. Department of Commerce where she advised the Import Administration in connection with its implementation and enforcement of U.S. antidumping and countervailing duty laws. In that capacity, Dean Buys defended the agency’s decisions before the Court of International Trade, the Court of Appeals for the Federal Circuit, and World Trade Organization panels. Prior to that, Dean Buys was in private practice with a Washington, D.C., law firm that specialized in international transportation law. Dean Buys has an LL.M., with distinction, from Georgetown University School of Law in International and Comparative Law, where she earned the Chetwood Prize for the Most Outstanding Academic Performance. She also holds a J.D. degree and an M.A. in International Relations from Syracuse University. Dean Buys obtained her B.A. from the State University of New York at Albany where she majored in Political Science and minored in French and Fine Arts. Drawing on her experience in public and private practice, Dean Buys has published numerous articles and book chapters in the areas of economic sanctions, shipping law, trade law, arbitration, immigration law, consular relations law, U.S. treaty law and practice, and the intersection between U.S. constitutional law and international law.